Previously, on Back Issue Ben, I decided to cover Dreamwave’s Transformers. I have reasons. They have been covered elsewhere. 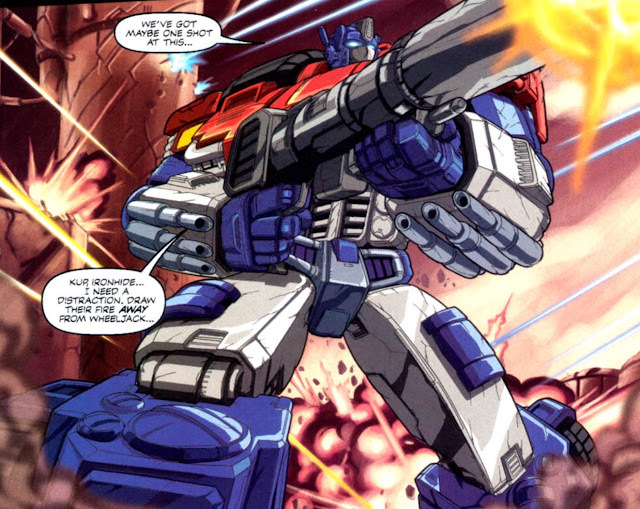 The War Within was a prequel detailing the early days of Optimus Prime as leader of the Autobots. He used to be an accountant, which I find both amusing and horrifying, also for reasons detailed elsewhere. That’s about it, let’s continue. The mysterious voices continue talking to Optimus Prime, even as he lay unconscious (or whatever robots are when they’re knocked out, dormant?). He boots up in a panic, looking for where Megatron might have landed. Back at Decepticon headquarters, Starscream has assumed command of the Decepticons, following his sneaky betrayal of Megatron (a trademark of his). He orders Shockwave to continue his assault on Iacon, while in-house he wants every scrap of information downloaded from Laserbeak. 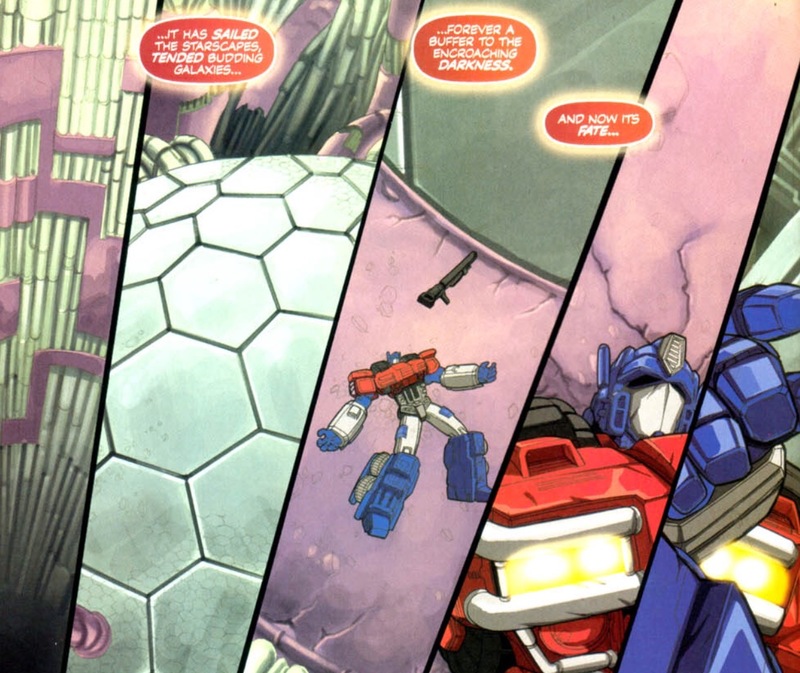 Optimus searches for more guidance from the voices, but they have nothing more to say. His self-reflection is cut short when Megatron blasts his way into the room, ready to resume their fight. Grimlock meets with his team of Kup, Wheeljack, and Ironhide. Prowl believes the Decepticons have made a tactical error focusing all their forces on Iacon. Prowl plans to keep them focused on Iacon, while they covertly evacuate essential hardware, and then strike back at unmanned Decepticon arsenals and positions. 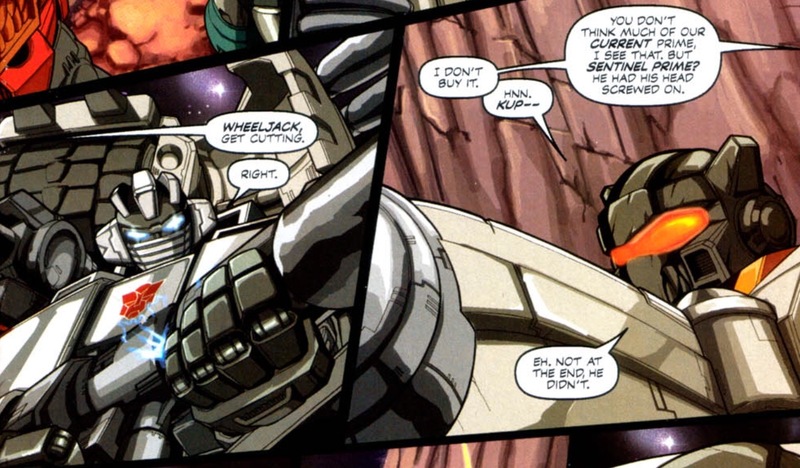 Ironhide mocks Grimlock’s assertion that they “let Iacon go,” since it sounds a lot like what Optimus Prime said about Cybertron. 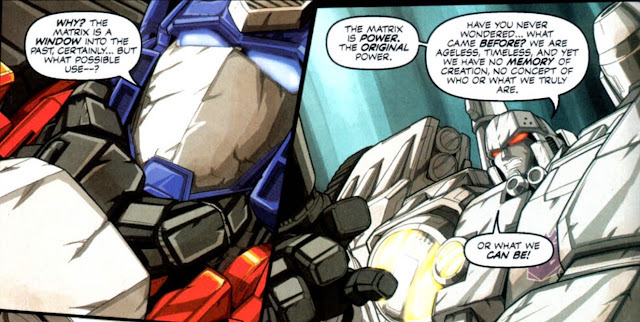 Megatron is easily handling Optimus Prime, all while boasting about the untapped power held within the Matrix. 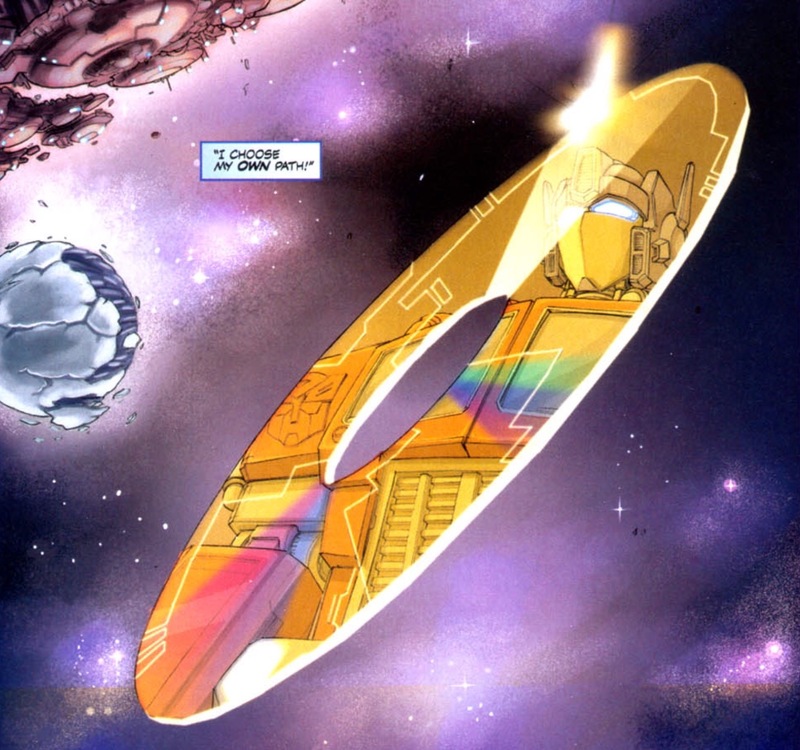 He imagines a mobile Cybertron no longer bound by orbits or spacial topography. Optimus doesn’t understand why Megatron believes the Matrix is so powerful, it’s merely a conduit to the past. Starscream has finished downloading Laserbeak’s info, confirming that there is a mechaforming sub-structure under the surface of Cybertron, a second skin. Once the war is won, you could theoretically wipe away the mess made of the planet by bringing that layer to the surface. 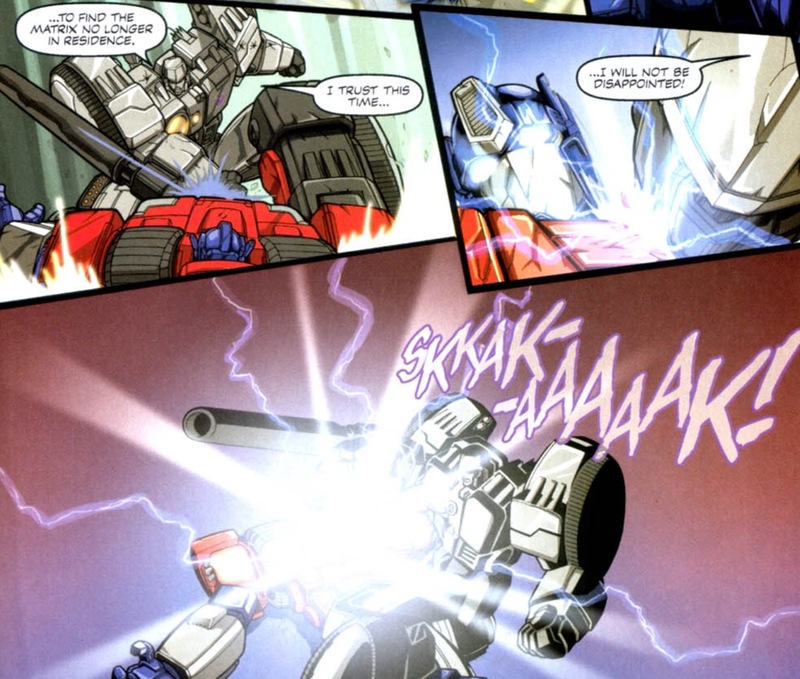 Optimus Prime puts up a good fight, but Megatron is able to crack open his chest cavity, causing energy to burst forth. Grimlock and his crew arrive at the edge of the former Forum of Enlightenment. Their specific mission is to find and, if necessary, rescue Optimus Prime. Megatron and Optimus are engulfed in the energy released by the Matrix. Next thing they know, they both find themselves on a world that looks very much like Earth. This series cruelly teased me with Tracks, and has failed to produce him since. Luckily, it’s been entertaining enough to make up for it, but this slight shall not stand. I will have what’s coming to me! Ironhide, Wheeljack, and Kup question Grimlock about his lack of respect for authority. I’m not sure they get an actual answer, but knowing comic book Grimlock, I’m going to chalk it up to Grimlock respects strength, not cunning. In Iacon, Shockwave and the Decepticons finish cracking the defenses of the city. 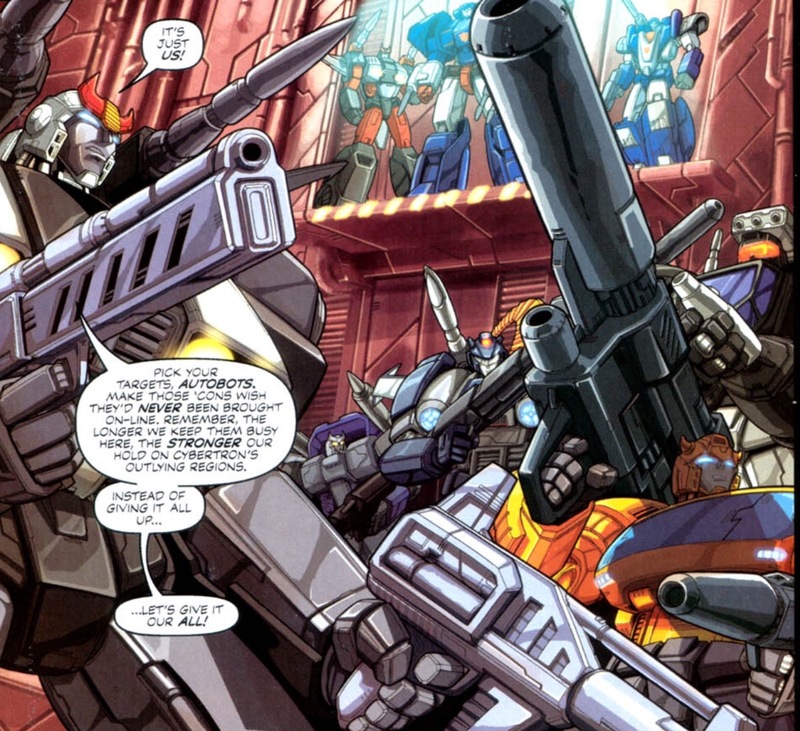 A small squad of Autobots, led by Prowl, prepare to fight them off. Grimlock and his team discover the engine turbines renovated by Megatron. Grimlock believes this discovery takes priority, as it threatens all of Cybertron. They spy on the nearby Starscream, who is ordering the Constructicons to reroute the power from the turbines. 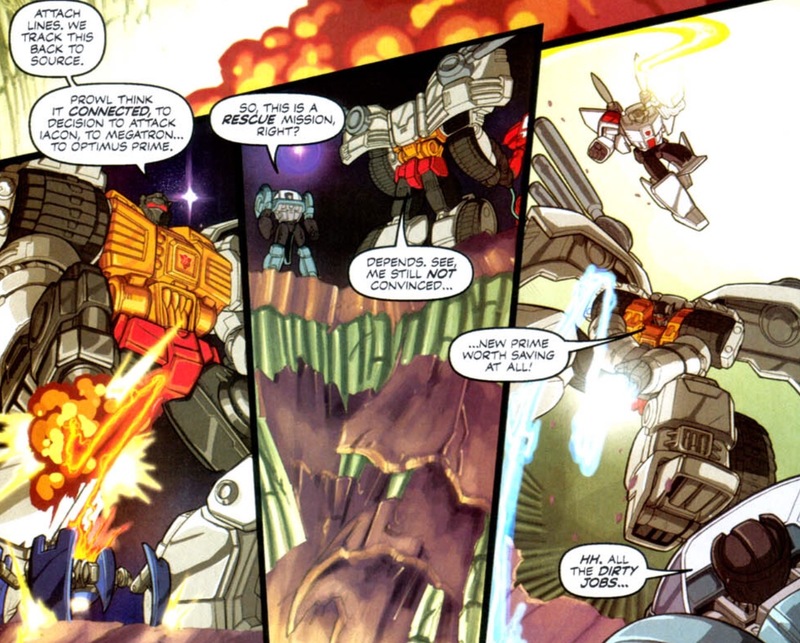 Grimlock orders the others to shut down the turbines permanently, while he continues to search for Optimus Prime. 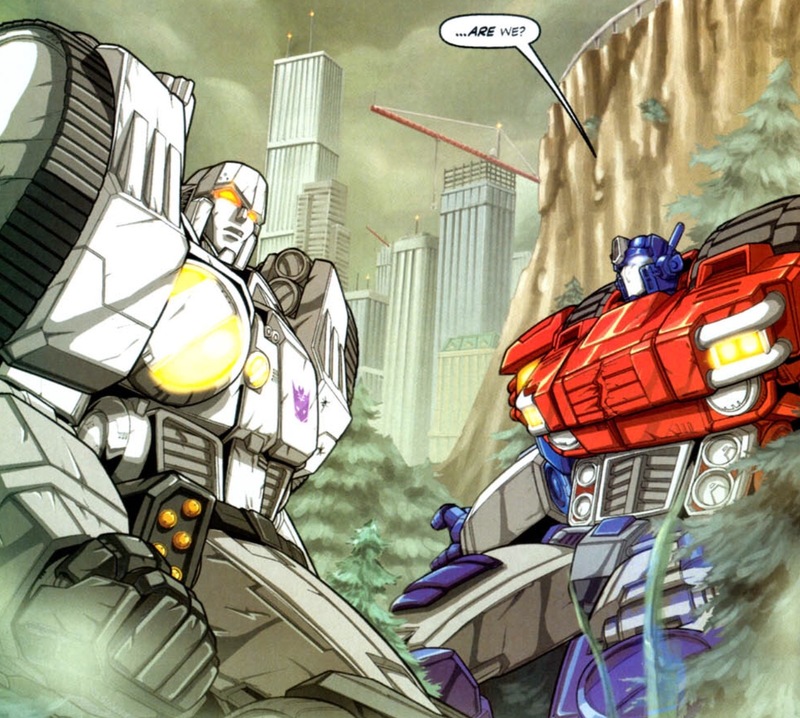 Optimus and Megatron try to determine where they are, when they look down and see future versions of themselves battling over Sherman Dam (fans will recognize this scene from the original Transformers cartoon). Scrapper tries to explain to Starscream that rerouting the power is no simple task, but Starscream doesn’t care. He has his own plans now. 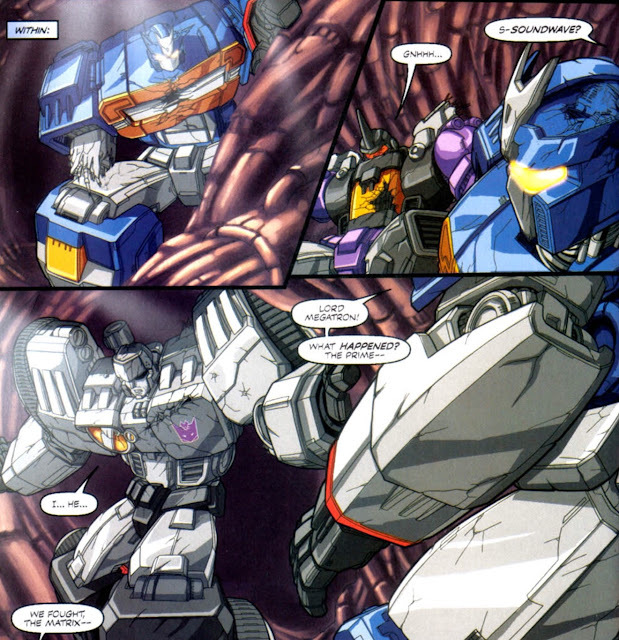 Ironhide, Kup, and Wheeljack listen to Scrapper and Starscream. There is no more time, the Decepticons have to be stopped now, before the entire surface of Cybertron is destroyed by whatever they’re planning. Grimlock tracks Optimus through the path of destruction and smashed Decepticons he left in his wake, deep into the bowels of Cybertron. Kup, Ironhide, and Wheeljack attack the Constructicons, despite being severely outnumbered. Starscream demands Scrapper finish the job. Optimus Prime and Megatron are once again engulfed in energy. 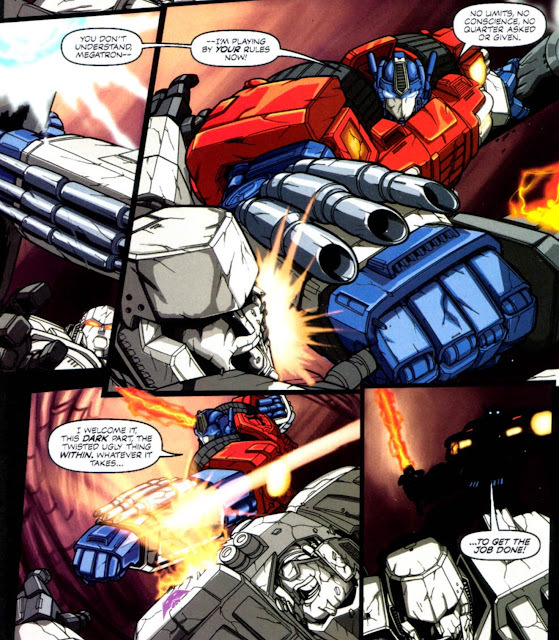 Megatron takes a swing at Prime, but he fades out of view before him. Optimus finds himself back in the present day, pulled free by Grimlock. Optimus insists that Megatron must be stopped. Grimlock lectures him about needing to be a strong leader, one that makes a stand, here and now, instead of running away. Instead of evacuating. The battle continues in Iacon, as well as deep below the surface. 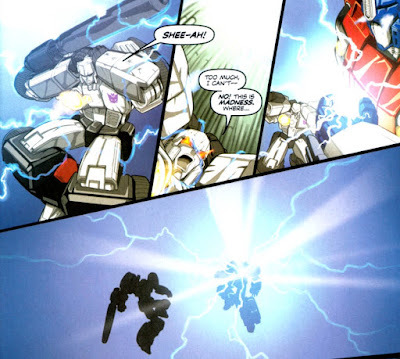 Prowl and his squad have fallen to Shockwave up above, while down below Starscream activates his device. The release of energy cracks the surface of Cybertron with its destructive power. Iacon collapses in a series of massive explosions. Deep within the planet, Optimus Prime prepares to end the threat of Megatron forever. 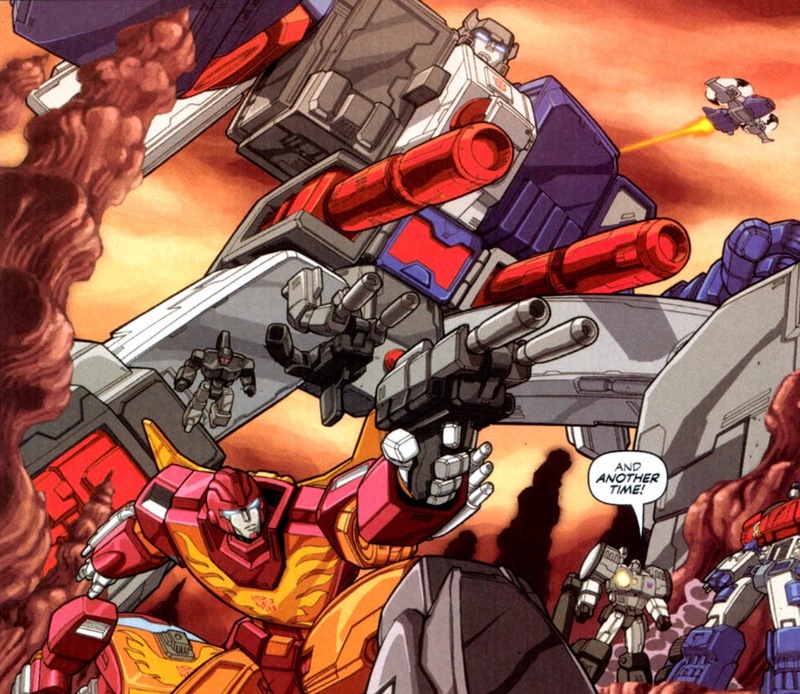 Kup, Ironhide, and Wheeljack are pinned down by Decepticons, while the turbines threaten to turn Cybertron inside out, destroying all their friends on the surface. 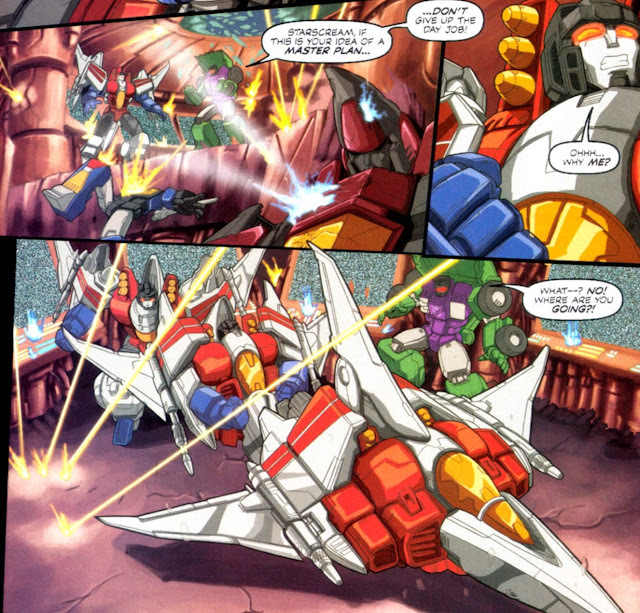 Scrapper warns Starscream that the energy from the turbines isn’t compatible with his platform, and it’s beginning to overload. On the surface, Shockwave and the Decepticons retreat from Iacon back to their home base. Optimus and Megatron continue their battle, only this time, Optimus letting loose with everything he’s got. This time, there are no more limits, no conscience holding him back. Scrapper warns again, that the power they’re misusing will tear Cybertron apart, but Starscream doesn’t care. 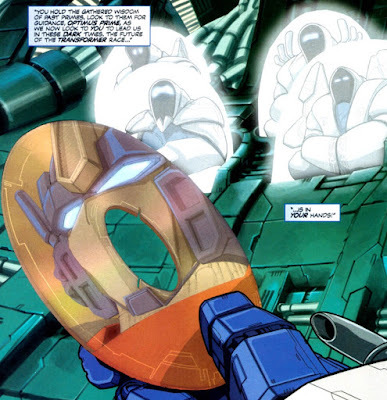 Either Cybertron will be his, or nobody’s. 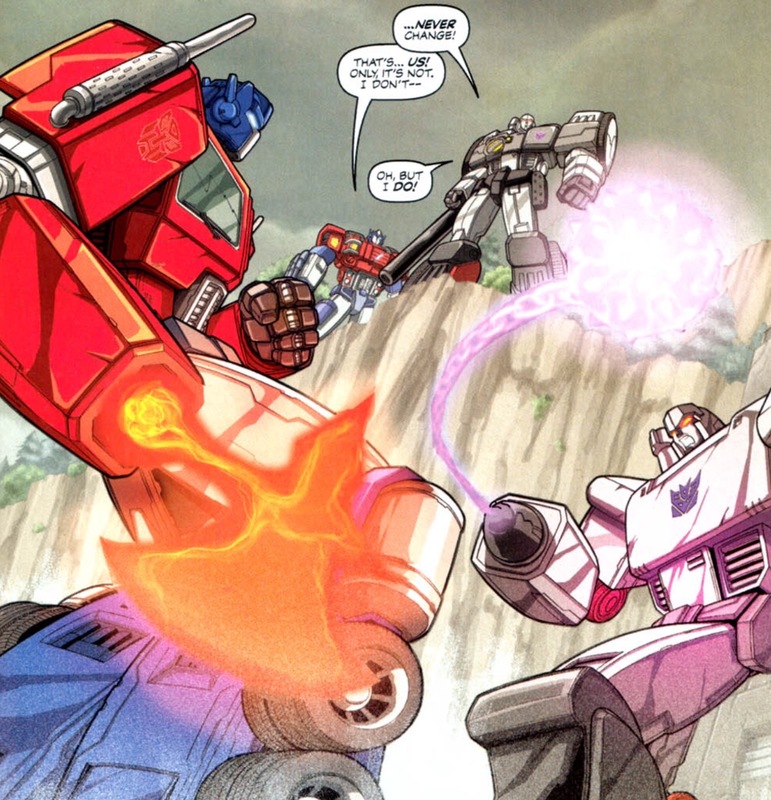 Prime relays orders to Wheeljack, and directs Ironhide and Kup to lay down some cover. Kup is pretty much the worst Autobot ever. He’s the equivalent of your grampa telling you stories of back in the day. Great for Thanksgiving, not so much for an action cartoon. But you know Hubbs used to take the toy with him everywhere as a kid. That and old Obi-Wan Kenobi. Optimus tells Grimlock that he’s taking command of his team, whether he likes it or not. Wheeljack locates the point of origin of the raw energy fueling the turbine. Optimus Prime orders the Autobots to retreat to the surface. Wheeljack lets fly a missile into the energy source, destroying it and the turbine in a massive explosion. Later, Optimus and the others stand over the smoking crater that used to be Iacon. The Autobots finally understand Optimus Prime’s earlier thoughts. There can be no winners or losers in this war, only a wasteland. 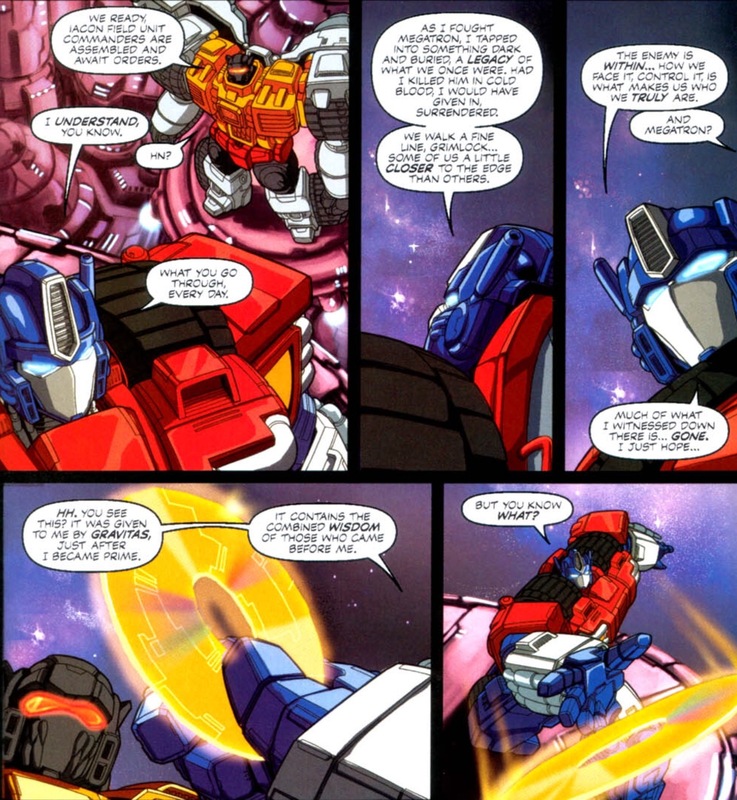 Yet, Optimus Prime has changed his mind, they are staying on Cybertron. If they don’t end the war here on this planet, it will only escalate and spread throughout the galaxy. Later still, Grimlock gives Optimus Prime an update on status of forces. Optimus talks to Grimlock, tells him he understands what he goes through. When he fought Megatron, he tapped into something dark and buried. Had he killed him, he would have given in to it. (Yes, but you would have saved so much later misery. 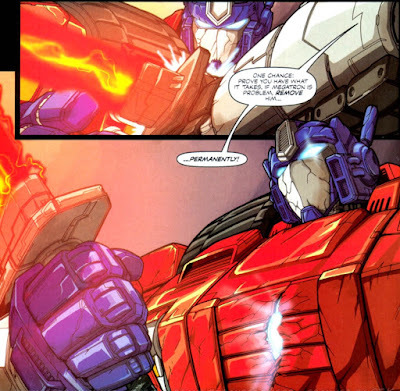 This is a war, Optimus.) They all walk a fine line, but some of them are a little closer to the edge. The real enemy is (wait for it) within. “But you know what,” he says, as he throws the disc into space. The need to always focus on Optimus Prime, Megatron, Grimlock, and Starscream in every project can get tedious at times, but makes complete sense for a series like this. It absolutely should begin with them. Like I said last week, this series absolutely held up to my memories of it. All the metaphors for things “within” were a little much, but not in an annoying way. Grimlock and Starscream were right on point with my personal interpretations of the characters. Figueroa did an outstanding job of redesigning the characters, but still making them recognizable enough to the versions we know. Furman, is, well, still Furman. One of the best Transformers writers that ever did it. 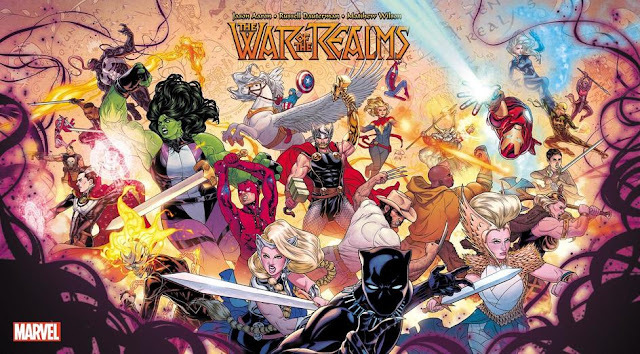 A good story, great art, and the best characters ever devised by human beings. Can’t ask for more than that. Next week, I don’t know, I’m writing this 4 months before it’s on the internet anyway. It could change.